Madison Takes 6th Place at the 2012 PSAL City Championships. On the second weekend of February, the Madison winter wrestling season culminates with a trip to Petrides high school on Staten Island for the PSAL Individual Championships and State Qualifier. Those that are crowned City Champions go on to the New York State Tournament at the end of the month. This year Madison had some young hopefuls heading into the tournament, with Marc D’Chiutiis at 126 pounds coming the closest with a tough loss in the finals to Gannone from Tottenville. Konstantin Parfiryev at 145 pounds battled back after a difficult loss in the semi finals to take 3rd place with a 9-7 decision over divisional rival Malik Francis from Wingate. Javaughn Grant placed 4th at 220 pounds. 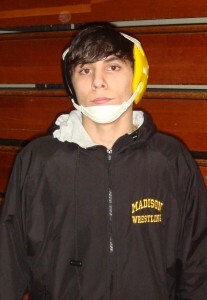 In a two day tournament with 43 PSAL wrestling teams competing, Madison finished in 6th place. What makes this more impressive is that all but two of the qualified wrestlers who competed over the weekend are returning to the line-up next year. 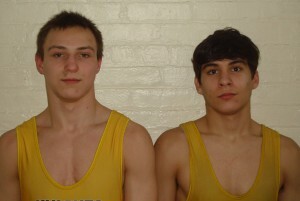 Madison’s new team captains: Konstantin Parfiryev and Marc D’Chiutiis. The Golden Knights will begin their spring freestyle season on March 5th.